Rachel : Oh wait! Before you guys go, Can I just ask you a question? Rachel : When a guy breaks up with his girlfriend, what is an appropriate amount of time to wait before you make a move? Phoebe: Oh, I’d say about a month. Monica: Really? I’d say 3 to 4. Monica: When it’s your assistant, I would say never. Joey: All right, Rach, the big question is, does he like you? All right? 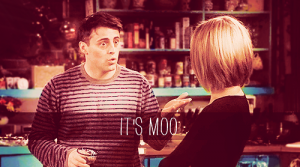 Because if he doesn’t like you, this is all a moo-point. We talked much about it though, it still remains a moot point.